Mr. President and Brothers of the American Railway Union. We struck at Pullman because we were without hope. We joined the American Railway Union because it gave us a glimmer of hope. Twenty thousand souls, men, women and little ones, have their eyes turned toward this convention today, straining eagerly through dark despondency for a glimmer of the heaven-sent message you alone can give us on this earth. You all must know that the proximate cause of our strike was the discharge of two members of our grievance committee. Five reductions in wages. The last was the most severe, amounting to nearly thirty per cent, and rents had not fallen. Pullman, both the man and the town, is an ulcer on the body politic, he owns the houses, the schoolhouses, and churches of God in the town he gave his once humble name. And thus the merry war—the dance of skeletons bathed in human tears—goes on, and it will go on, brothers, forever, unless you, the American Railway Union, stop it; end it; crush it out. Company C. Second Regiment…disciplined a mob of rioters yesterday afternoon at Forty-ninth and Loomis Streets. ‘the police assisted and... finished the job. There is no means of knowing how many rioters were killed or wounded. 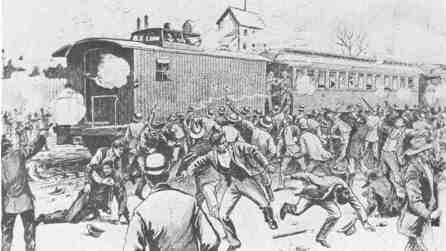 The mob carried off many of its dying and injured. A crowd of five thousand gathered. Rocks were thrown at the militia, and the command was given to fire. To say that the mob went wild is but a weak expression... The command to charge was given… From that moment only bayonets were used… A dozen men in the front line of rioters received bayonet wounds. Tearing up cobble stones, the mob made a determined charge… the word was passed along the line for each officer to take care of himself. One by one, as occasion demanded, they fired point blank into the crowd. The police followed with their clubs. A wire fence enclosed the track. The rioters had forgotten it; when they turned to fly they were caught in a trap. The police were not inclined to be merciful, and driving the mob against the barbed wires clubbed it unmercifully... The crowd outside the fence rallied to the assistance of the rioters… The shower of stones was incessant. The ground over which the fight had occurred was like a battlefield. The men shot by the troops and police lay about like logs. In Chicago that day, thirteen people were killed, 53 seriously wounded, 700 arrested. Sefore the strike was over, perhaps 34 were dead. With 14,000 police, militia, troops in Chicago, the strike was crushed. "The issue is Socialism versus Capitalism. I am for Socialism because I am for humanity. We have been cursed with the reign of gold long enough. Money constitutes no proper basis of civilisation. The time has come to regenerate society—we are on the eve of a universal change."